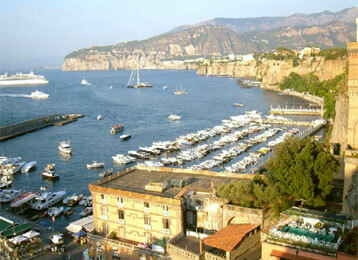 Sorrento is a small city built on cliffs over the sea. It is a popular tourist destination surrounded by lemon gardens. From the town can be easily reached Naples and Pompeii, as it lies at the south-eastern end of the Circumvesuviana rail line. The town overlooks the bay of Naples, as the key place of the Sorrentine Peninsula, and many viewpoints in the city allow sight of Naples itself (visible across the bay), Vesuvius and the island of Capri. Sorrento is also famous for the production of limoncello, an alcoholic digestif made from lemon rinds, alcohol, water and sugar. Other agricultural production includes citrus fruit, wine, nuts and olives. Wood craftsmanship is also developed. You can have a Civil Wedding in the Cloister of San Francesco a medieval well preserved Cloister right in the center of the town.